Industrioushead: Squid Bird announces the winner!! 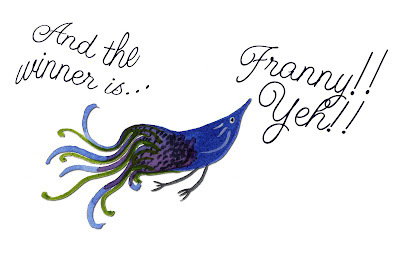 Squid Bird could hardly sleep last night, knowing that the winner would be announced today! Now the time has come and the happy winner is Franny. Congratulations Franny, I will be in touch with you and I hope you enjoy the little felted bag! This has been a wonderful event and I have seen so many great blogs, full of amazing art work and friendly women from all over the world. Thank you to everyone who entered my drawing and took a little time to visit my blog. Your comments have been a great joy! It WAS fun, wasn't it? I'll definitely do this again next year. Now the fun part of getting to know all of these new bloggers better begins! Congrats Franny! Emily, I love squidbird!